Today let’s take a look at the recent moves the U.S. administration has made against Venezuela, and what that means for oil prices. It was August of 2017, when Trump first stepped up pressure on Venezuela. Venezuela is (and has been) in a humanitarian, political and economic crisis–led by what the U.S. administration has officially called a dictator. Trump slapped sanctions on the Venezuelan President back in 2017 (freezing his U.S assets) and was said to be considering broad oil sanctions. That finally came yesterday (seventeen months later). For a country that relied heavily on oil exports (ninety-five percent of export revenues in Venezuela come from oil), the U.S. will no longer be sending money to Venezuela for oil. This is a crushing blow for an already suffering country. Venezuela has the world’s largest oil reserves. With oil sanctions, should come supply disruptions for the oil market, which could likely send oil aggressively higher. 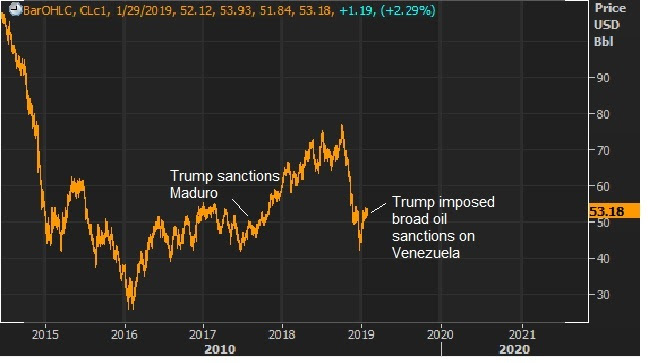 Back in 2017, when Trump threatened sanctions, oil broke out of its $40-$55 range, and ultimately traded up to $76. Today, we’re nearing the top end of that same range.